A good few people have emailed me asking about whether it is possible to make Polow, rice mixed with other ingredients, in a rice cooker and if yes, how would they go about it. 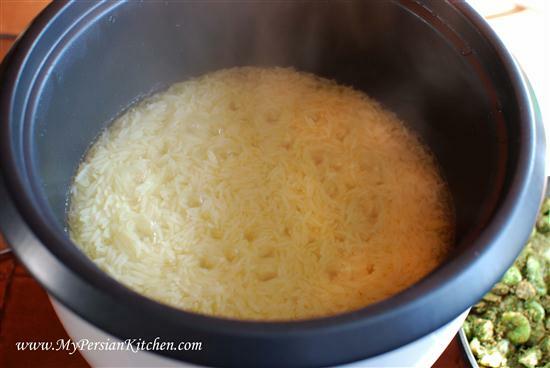 This is a perfect time to do a post about how to do this post in light of my Persian Rice Cooker Giveaway. 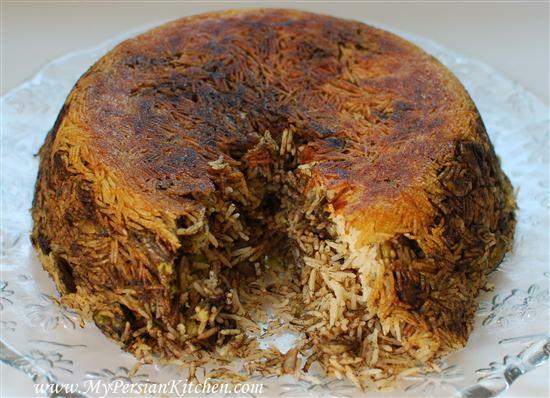 I have previously posted how to make make Persian Rice in a Rice Cooker and Baghali Polow, Persian rice with fava beans the traditional way. Today I am going to make the same recipe in the rice cooker. It’s actually super easy and it cooks fast! There are two different schools of thought when it comes to making polow in a rice cooker. Some people will throw all of the ingredients at once while others will add the condiments to the rice once the water in the rice cooker begins to absorb. The very first time I made polow in a rice cooker I naïvely took someone’s advice that follows the first mentioned approach. Said person told me to throw everything in the rice cooker, give it a stir and that’s it. Let’s just say that I ended up with all of the ingredients that were supposed to be mixed with the rice sitting on TOP of it by the time my rice was ready. I have experimented quite a bit and have come up with the perfect method that works every time! Wash rice as you would normally. Place rice in Rice Cooker with 3 cups of water. Add salt and 2 tablespoons of canola oil. 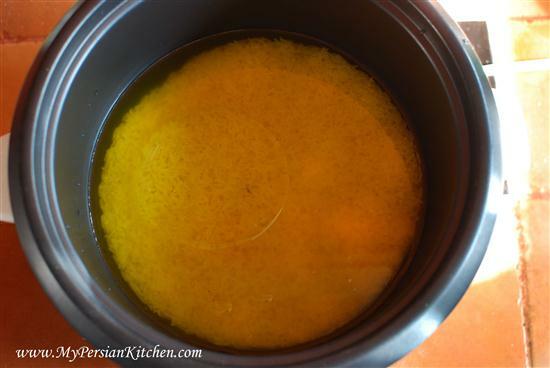 Add 2 tablespoons of brewed saffron, mix well, and place lid on. Begin cooking process by pressing cook. 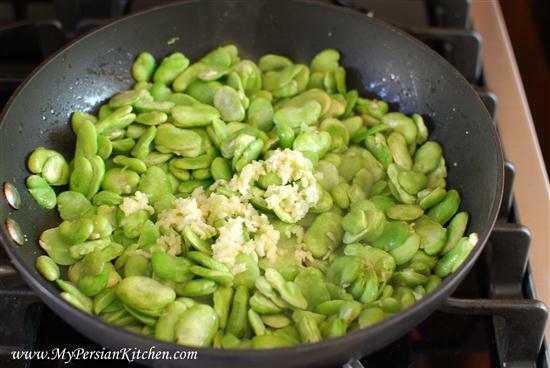 While the rice begins cooking saute fava beans in some oil along with minced garlic. Season with salt. Add dill and advieh to the fava beans. Turn off heat and mix well. By this time your rice should have absorbed most of its water. Keep an eye on your rice. 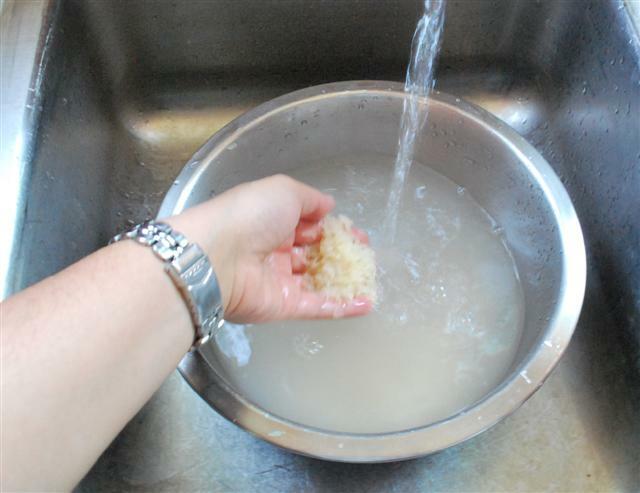 As soon as you notice that the water has mostly absorbed it is time to add the fava beans to the rice. 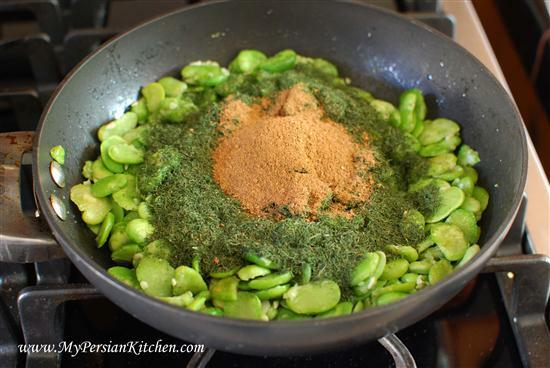 Gently mix the rice and fava beans mixture together so that it is all incorporated. Add 1 tablespoon of canola oil on top. 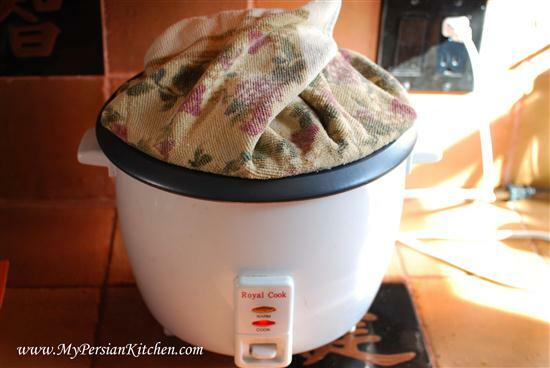 Place a towel over the lid and allow the rice to continue cooking until the light switches from cook to warm. This should take about 45 minutes or so. Once the rice is ready flip it onto a serving dish. 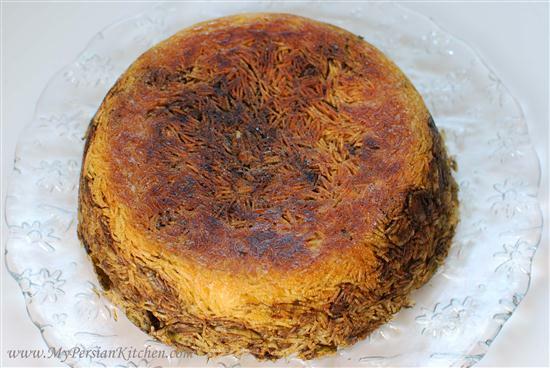 AAAAHhh look at that Tahdig!!! Yum!! As you can see making polow in a rice cooker is super easy!! Hi sanam jan thanks very much for the nice and easy way you tell us how to make persian meal,by making baghali polo I see the word advieh wich makes me curious .As you know in Iran we call all that different tasty stuff advieh,or Im wrong. Is zaffran also advieh? if not what is exactly advieh?thanks to you Im going to make baghali polo for the first time afther 33 years,thanks again sjarog. Hello I’ve never seen baghali polo look like this. The rice is supposed to be white (with exception of saffron and herb which make it more green and orange). This looks more like loobia polo. Your picture makes it look very brown. Hi there! Just one question: What is the difference between a Persian rice cooker and a normal rice cooker? Hi, I was wondering if the rice should be prepared beforehand, i.e. with salt added and left for a few hours/overnight before being used or does this recipe not warrant that? Thank you and GREAT site!! Huda, you don’t have to soak the rice for this one. But if you do, it’s best! Emily, you can unplug and re-plug your rice cooker and see if that helps. OMG. Just found your site!!! How awesome. Some Vegan, Persian, AND slow cooker recipes!!!!! Have to share with my Persian Friend!!!!! First thank you for creating this website (especially for those of us who are “Cooking Challenged” but determined to become a good cook). I’ve moved away from my “home-town” and after many years of relying on my mother’s Persian cooking, now I’m on my own. My mother bought me a Persian rice cooker and the setting does not have the traditional “warm/cook” button on it. Instead it has numbers for the temperature setting based on the darkness of the tadig I believe. I’ve managed to make a good chellow (finally) but my baghali polo was a disaster tonight! Have you worked with the “Pars Khazar” Rice cooker? Can you please give me some advice or tell me how I can tweek your recipe since the “warm/cook” button doesn’t apply? I tried following a recipe in the standard “Food for Life” book with some common sense only to find out I was lacking the common sense. I used dried dill instead of fresh and didn’t convert the dill portions. I poured the lima beans and dill after the rice had cooked for about 15 minutes (still some water on top of rice) and it soaked up so much of the water that I then added two more cups of water. I ended up with all the dill at the top of the polo and the tadig burnt a little. Thoughts? Neda jan, thank you for your kind words. I used to be a challenged too as far as Persian food is concerned!!! The only rice cooker that I have ever used is my own which you see in the picture. I have to tell you that I had to experiment with mine a few times until I got the water and rice ratio correct. My mom insisted that when cooking in the rice cooker I had to add 1 1/4 cup water per cup of rice. After a few trial and errors I figured what the correct ratio was. Since I don’t know how to work with your rice cooker, I would start by putting your tahdig setting on the lowest available option. I would wait a bit longer to pour in the rice. Keep an eye on it and make sure that all you can see is little bubbles of water between the rice. At that point add your lima beans and dill. 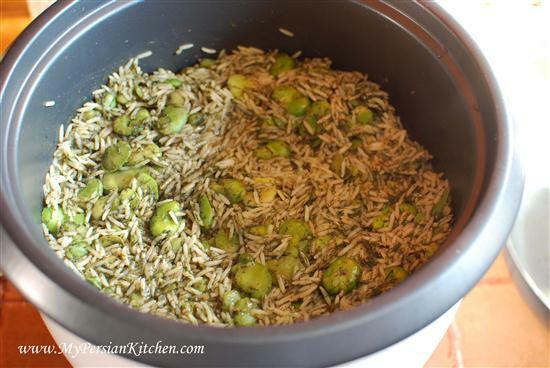 If you add both of them when there is still water in the rice cooker, both the dill and lima beans will simply float on top of the rice and cook that way. I hope this helps! Love your website and your dishes! I have made so many rice dishes in my rice cooker in the past few years! Thank you for posting rice cooker recipes. I have a couple of questions about this recipe. Does the baghali need to be thawed first or do you put it in the sauté pan frozen? Secondly, how many people does this recipe with 3 cups of rice serve? Farzin, you should always thaw veggies before cooking. This recipes serves 4 to 6 people. I tried this and my rice came out mushy! So sad! The flavor was there but the texture of my rice was no good. Going to persain shop this week and gonna get some better basamati. Hopefully it will turn out better next time! Love your website! Thanks for sharing all of these recipes! Hi Sanam, thia recipe looks fabulous and easy to make…I would love to try and make this one, need help with one ingredient…what is adveih ? and is there any replacement ingredient to use ? can I use cumin powder or something like that? Hi, this recipe calls for 3 cups of rice which I believe is less than actual cup measurements. Since I don’t have the “small cup” you use that came with the rice, could you tell me what the actual cup measurement is for “3 cups of rice” and how much actual water measurement to use as well. Want to try this rice recipe tonight. Thanks. Marilyn, you can use the regular size cup for the rice and use the same measuring cup for the water. The ratio is 3 cups water per 1 cup of rice. Hi! I do love your site. Thanks for posting a rice cooker version of this rice. 1. My frozen fava beans had skins on them. Your non-rice cooker recipe called for the fava beans to be peeled. So these fava beans need to be peeled, correct? 2. In the ingredient list you have listed 3 cups of rice. After the rice is rinsed, soaked, and drained, the recipe calls for only 3 cups of water to go into the rice cooker. This is a lot less water than I usually use, so I am hoping it will work out. I just wanted to double check. Thanks again for your site! I wish you were in NYC so I could take some classes from you. Kelly, yes, the fava beans need to be peeled. I have mentioned before in my rice-ccoker tutorial that I find that rice cookers require different amounts of water. I have found that my rice cooker works best for me when I put equal amounts of rice and water.